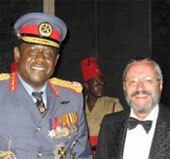 ATA Uganda Chapter member Prof. Thome (right) of Kampala, with Actor Forrest Whitaker, from the movie, "The Last King of Scotland"
First Africa Media Exchange featured at 4th IIPT African Conference on Peace Through Tourism, Kampala, Uganda, 20-25 May 2007. 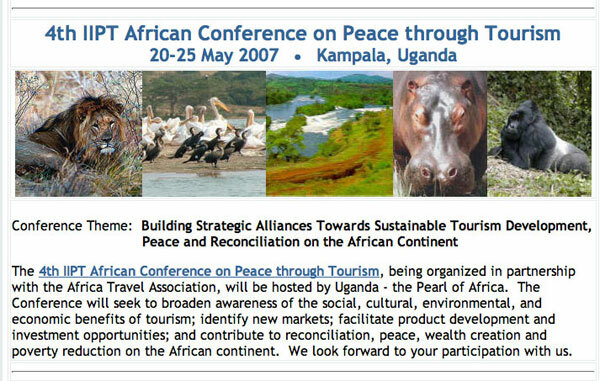 Under the patronage of His Excellency Yoweri Kaguta Museveni, President, Republic of Uganda, the event is being organized in partnership with the Africa Travel Association, and hosted by the Uganda Ministry of Tourism, Trade and Industry.  Premier of Bermuda Dr. Ewart F. Brown keynote speaker.  Databased Directory of Ugandan Key Contacts in the World Diaspora.  Hot News items by Prof. Wolfgang and Esther Thome.  Mountains of the Moon and White Nile Adventures by Cam McLeay.  New Radio Features, plus TravelCasts and Audio Tours of Uganda.  Air Highways to Uganda - Transportation and Communications.  Photo gallery features past events, fashions and visitor attractions in Uganda. Much more to come on this page.